Combining two leading products, UDA ConstructionSuite Standard is designed to be the essential entry-level system for small construction firms. 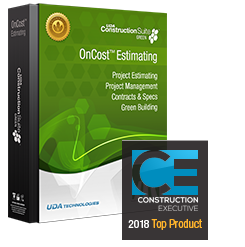 Offering powerful tools for managing projects and contacts, ConstructionSuite Standard includes upgraded Estimating, Contracts, Specifications, and Document Management with the new Items Database and ConstructionNet Lite. TotalCare Select Optional TotalCare Coverage ---------------------------- Basic Support (30 Days Phone & 1 Year Email Support) ............................. TotalCare Options (Priority Phone Support, Online Training, and Upgrades) Monthly TotalCare Plan - Single License - Add $29.99 per month Prepaid 12-Month TotalCare Plan - Single License - Add $199 per year ............................. Monthly TotalCare Plan - 2-4 Licenses - Add $49.99 per month Prepaid 12-Month TotalCare Plan - 2-4 Licenses - Add $349 per year .................................................................................................................................................................................... NOTE: Monthly TotalCare Support and Membership Plans are billed monthly and can be discontinued at any time. Prepaid TotalCare service will bill monthly after the first year.